Earlier this month, my dear friends Stephen and Jay took me (and DH) to a lovely, geographically inconvenient (for them) and expensive French restaurant to celebrate my birthday. So when Stephen's birthday rolled around last week, I wanted to acknowledge it. 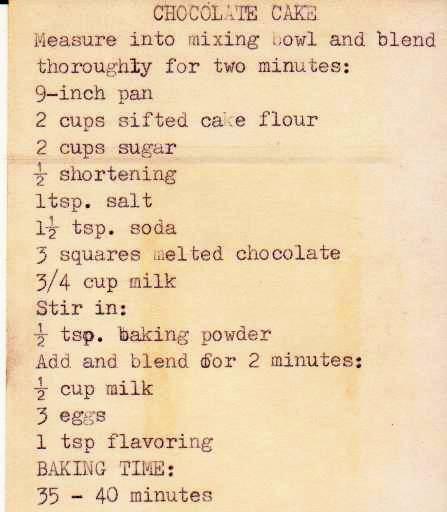 And what better way to do that than to bake a cake. 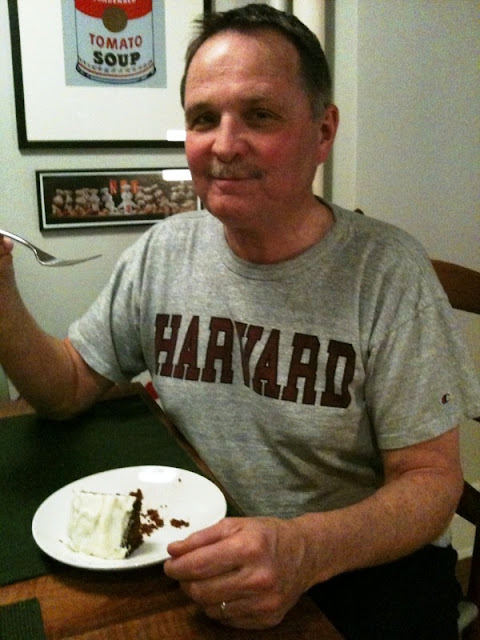 Jay suggested German chocolate cake, an endearing choice because of its deliciousness and intentionally homey appearance. But it was not to be. Finding a bar of German chocolate at 9 p.m. in my neighborhood proved impossible. 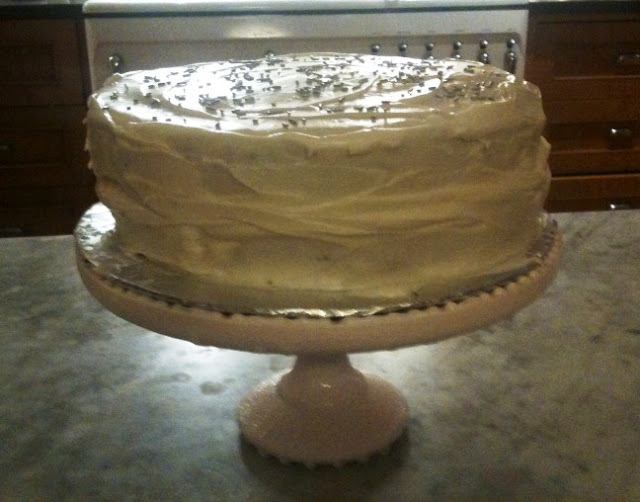 After a bunch of panicked texts with Jay (and kicking myself for always waiting until the last minute), I decided to make Chocolate Cake and Creamy Honey Icing, from the same recipe collection as the Moonlight Chocolate Cake that I made a few weeks ago. 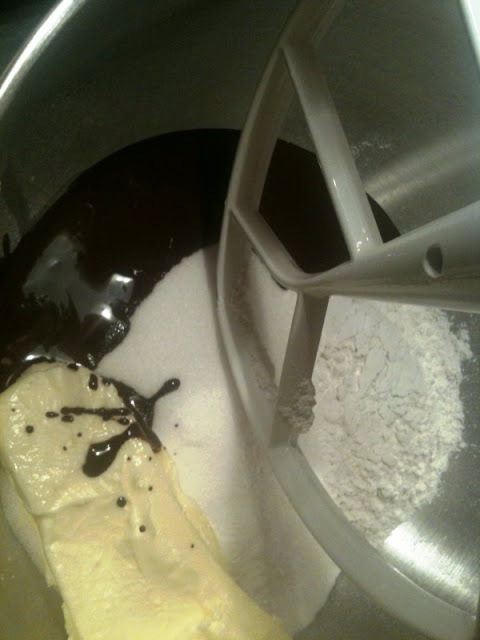 Now I can whip up a chocolate cake pretty easily, but that night I was worried. After getting some rotten news at work earlier, I was seething with anger that even an after work cocktail didn't assuage. I feared that my bitterness would somehow seep into the cake, like some unwanted ingredient. But just the opposite happened. As I started to bake, my anger began to dissipate. The sifting of flour, measuring the sugar, the orderly preparation of the batter all proved soothing, as did the thought that the finished cake would make the birthday boy very happy indeed. 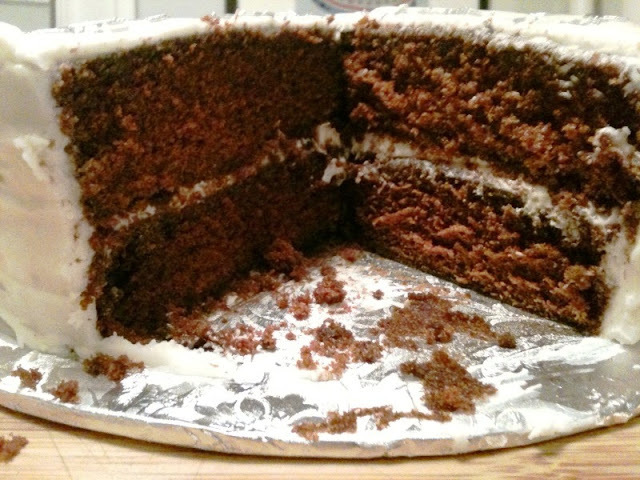 This chocolate cake, despite its plain Jane name, was actually better (or at least equal to) Moonlight Chocolate Cake. I sort of followed the frosting recipe, but thought it needed *something*, so I added more of everything, plus some cream cheese for good measure. 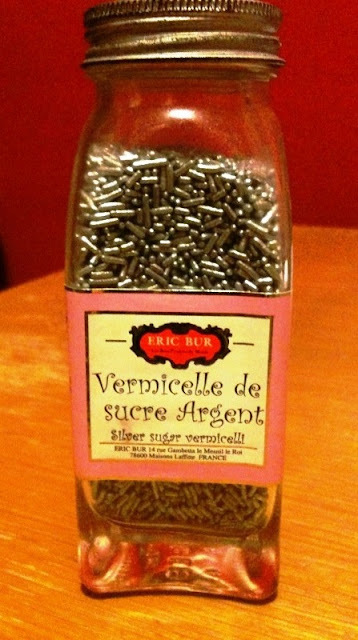 And topped the whole thing with silver sprinkles I bought at the Bon Marche Grand Epicerie in Paris. Jay brought the cake to Stephen's birthday lunch at an East Village restaurant (where I'm told they weren't charged a "cake-age" fee to have it served). Jay wants everyone to know that he took these pictures there (and also that he went to Yale for graduate school...but not that he's a priest!). Jay said the cake was FABULOUS and Stephen said it was the first home-baked cake he'd had since he was a child. And that was just a few years ago. Really! !